Fresh from my ever-growing stash of mostly-oldie gems sent from the wonderful Si and her travels hither and yon in India, I give you Man-Mauji, a very very cute movie starring Sadhana, Kumari Naaz, Kishore Kumar, Pran, Om Prakash, Durga Khote, and a ton of other people, including someone named Jhony Whisky. The drama, action, and emphasis of the plot were nicely distributed among the leads and supporting cast. 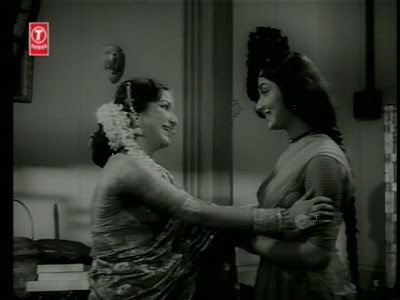 If anyone emerges as a star, it's the two women, who as the sister (Kumari) and love interest (Sadhana) of Kishore's character Raja put a lot of courage and thought into getting him out of scrapes that result from his lies and bad decisions. (Raja is one of those jolly criminal types, and it's hard to be mad at him for stealing, given the givens - medicine for Maa, trying to help his sister with school fees, you know the type.) 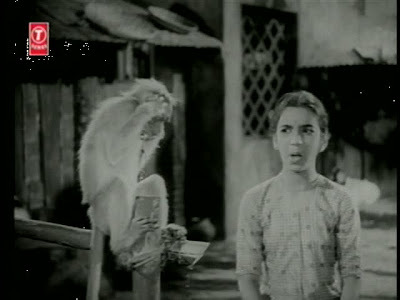 He's the central character, in that most of the story is in response to him, but I thought the film's emotional heart was with sister Laxmi and love Rani. And they like each other, too - none of that tiresome, man-based jealousy crap. The lyrics of the latter broke my heart. Who among us has not felt like a fool? "I wish I had never met you. I wouldn't have lost my peace and hurt myself today. I wish I wouldn't have fallen in love with you. " 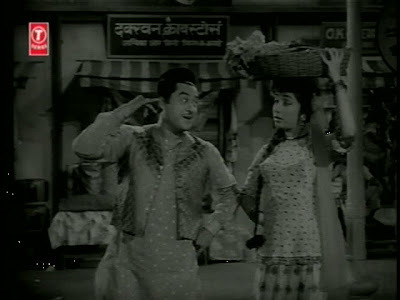 and "Ek Tha Abdul Rehmam," a takin'-care-of-business vegetable-selling duet by Sadhana and Kishore. and I really don't have much more to say about it than that - which is by no means criticism. It's totally charming, and you should watch it, even if just for the clever monkeys, doe-eyed expressions, and prominent vegetables. I watched this with Memsaab, and she agreed: "It's very cute. That is all." And that is plenty for a Wednesday night pick-me-up. I first watched this when I was young and callow, and didn't like the idea of a beauty like Sadhana being paired with a nut like Kishore! Have grown up since and like it a lot better - though I agree with memsaab that it's cute, that's all. I rather like the music and pep of the Zaroorat hai, zaroorat hai song too, even though the lyrics are pretty sexist - all he wants is a woman to look after him. Yikes! Madan Mohan writes beautiful music, which I say based entirely on the soundtrack to Veer-Zaara (I love that the music to that movie was written 50 years ago and was meant to be sung by Lata, and it worked beautifully for a 2005 movie and Lata was still around to sing it). Anyway I wonder if I can find this one around here. It sounds fun. I might watch this just for the music... It looks really cute, though, and I'm all in favor of that. 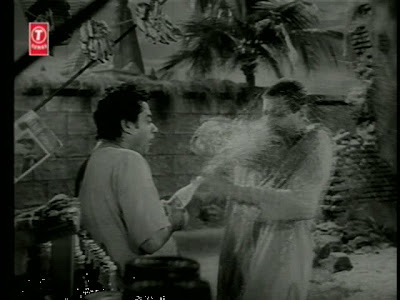 KISHORE-DA! I am a sucker for his particular brand of slapstick comedy - in fact I illustrated "Bollywood comedy" in my lecture with a clip of Kishore doing something dumb yet comical. I am curious about this "Jhony Whisky" fellow. I think my Bollywood comedian name is going to be Khary Rum'n'Coke! Or maybe I'll use the word verification word: Grancha! It IS cute. 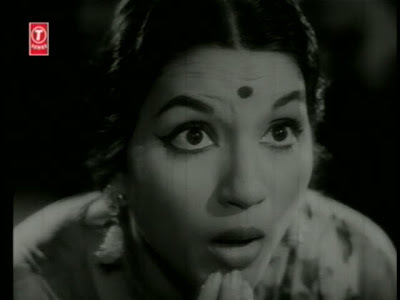 I *heart* Kumari Naaz. 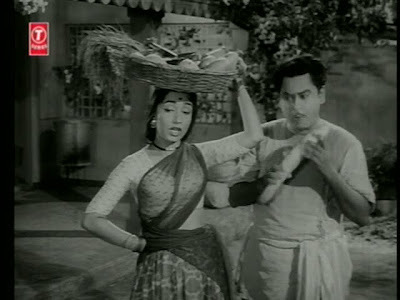 Sadhana and vegetables?!! This I must see, inspite of Kishore Kumar (unlike dustedoff, I've not grown to appreciate "the beauty and the nut" scenario, yet). 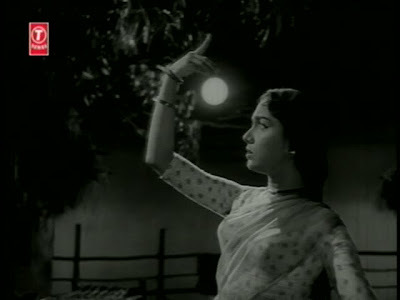 And "just cute" is a pretty good recommendation for a Sadhana starrer, especially one with such beautiful music as this. dustedoff - It definitely falls into the category of appearance-based double standards. Agreed, cute but not more (and no less). Somehow I missed the lyrics completely - I'll be sure to pay attention next time I watch. Ellie - I am soooo not a fan of the music of Veer-Zaara, but that may be because of the singing rather than the songs as compositions. Filmi Girl - I think I'm at 80 unwatched DVDs. It's a little OOC. I too am growing fond of Kishore's acting. I have several of his films in my giant stack and am looking forward to them! 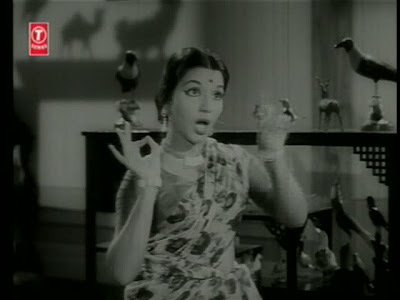 bollyviewer - Yes! She's a vegetable walli and has them with her frequently. I agree, with Sadhana and awesome music, what else does a person need? Shashi Kapoor day on twitter!